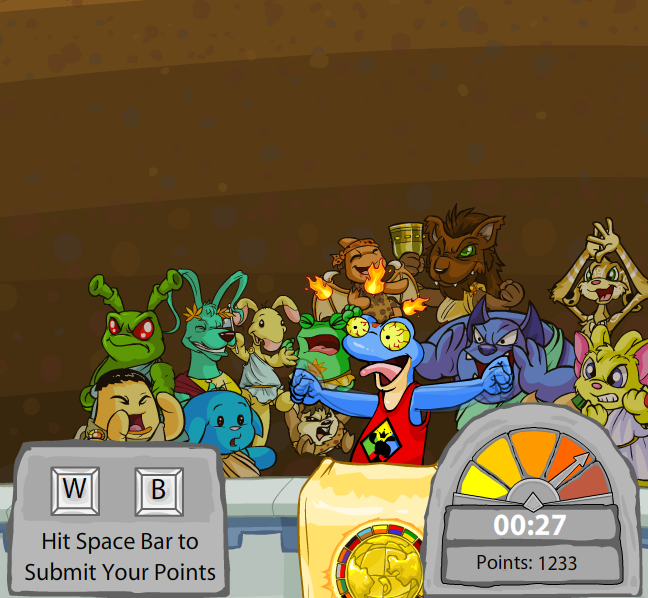 No Yooyuball game is complete without a legion of screaming fans on the bleachers! Show your team spirit and lose your voice in Make Some Noise, only available annually during the Altador Cup! To get the audience roaring, simply press the two letter keys displayed on the screen together and as fast as you can. The more frantic the audience becomes, the more points you'll receive! Sometimes you may see bonus keys pop up on the screen - press them for some extra points! Each game lasts 30 seconds, but if you'd like, you can end the game early by pressing the space bar. Your score is directly tied to the volume meter at the bottom of the screen. You must keep tapping the keys rapidly to accumulate points. If you slow down or stop, your point total will slowly drop down to 0. The bonus keys randomly award between 100-500 points, so they are worth pressing! As with all Altador Cup attractions, you'll be playing this game a lot to earn points for both your team and your personal rank. Since MSN can be strenuous on your hands, make sure to supplement long marathons with quick games of Yooyuball, Shooutout Showdown, or Slushie Slinger to give them a break. The minimum score requirement to earn Altador Cup points is 2,700. Any scores sent that do not meet the requirement will not count towards your point totals. The maximum amount of scores you can send per day is 401 games. All scores sent after hitting the maximum will not count towards your point totals. Press the space bar to end the game after you've earned 3,000 points during long marathons to save time. DO NOT press the tab key as this will end the game immediately with a score of 0.